STEP2:- Creating a Repository Service. 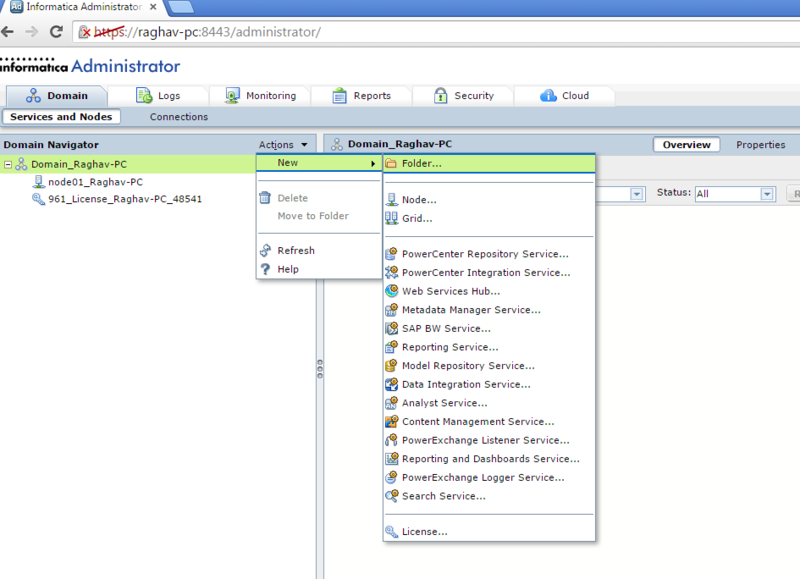 You will see the screen below, here click on Actions->New->PowerCenter Repository Service. STEP4:- Fill in the details as in the screenshot below and press Finish. Use the infa_rep schema password you created while installing Oracle 11g database. See Part 2 Step 10. This will create the repository service and start it in the exclusive mode. Keep the repository service in exclusive mode until we have created the integration service and are ready for connectivity from the client. Once we are ready we will recycle the repository service in Normal mode. STEP9:- Recycle the Repository service to start in Normal mode. Click on the repository service on the left hand many in Domain Navigator. Click the edit icon Repository properties and select Normal mode from drop down. This completes the setup of the repository and integration services. Now we are ready to connect the clients to the services and do a test run which I will describe in my next and final post in this series. Thank you sooooo much Raghav . it helped me a lot. Thanks Sanjay. You made my day. Not sure if i am using the correct connect string. I am able to log-in into the db using sqlplus using infa_rep. There are the parameters i am using. Listener Services for 11g are up and running. this is just for reference, some issues i faced during this installation process. reason Informatica is still not compatible with Oracle 12c. So, i have to install Oracle 11g. Note: Please install Oracle 11g 32 bit/64 bit only based on what version of Informatica installed on your machine else it will cause issue while starting repository services via Informatica Administrator web page. to resolve this you need to set “Code Page” under Integration Services –>Process–>General Properties–>Code Page from Informatica Administrator web page same as set under Informatica repository. It may be due to repository services running under Exclusive mode. 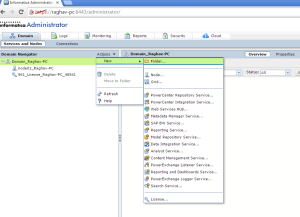 Problem 4: Informatica Repository was unable to change from Exclusive to Normal mode. to resolve this you need to create repository content via Action–>Repository–>Create repository content. Once this is done you will be able to change to Normal mode. Hope this will be helpful in case such issue. I am not able to connect to admin console.